Mutasian Entertainment LLC (www.mutasia.com) has launched the release of its new children’s sing-a-long album, ‘Christmas on Mutasia’, featuring 8 original Christmas songs and 3 Christmas classics to get families into the holiday spirit this season. ‘Christmas on Mutasia’ is available for download from the Mutasia website and can also be purchased with the fun and colorful e-book ‘A Nib Christmas’, based on the song by Rob Broadhurst and illustrated by Ryan McCulloch, and a cuddly Nib plush toy, all for a discounted price of $9.99 (plus S&H). 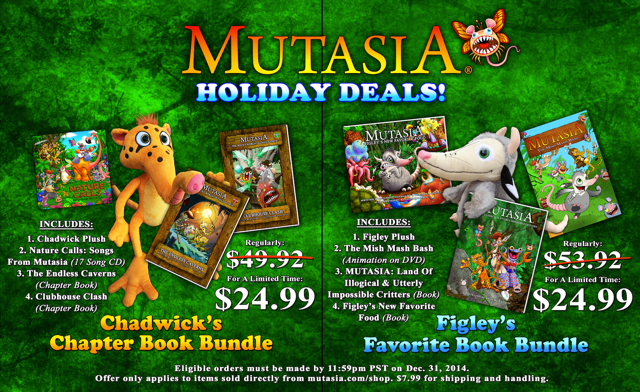 Mutasia has two other special seasonal options available for young readers this Christmas. The first is the Figley’s Favorite Book Bundle, which includes ‘Figley’s New Favorite Food,’ written by Suzanne Cotsakos and Chelsea Menzies and ‘Mutasia: The Land of Illogical and Utterly Impossible Critters,’ written by Rob Broadhurst, Suzanne Cotsakos, William McCulloch and Susan Menzies. These two bright picture books are now available to bundle with the huggable Figley plush toy and ‘The Mish Mash Bash’ 23-minute DVD, all for the special price of only $24.99 (plus S&H). The second combination from the Mutasia team is Chadwick’s Chapter Book Bundle. This bundle features two exciting adventure chapter books for junior readers: ‘The Endless Caverns’, written by Michael Flynn and ‘Clubhouse Clash,’ written by Justin Minkel, both award-winning elementary school teachers. These two chapter books can be combined with a plush toy of the lovable Chadwick and a fun 17-song CD, ‘Nature Calls: Songs From Mutasia’ all for the special price of $24.99 (plus S&H).